Chelsea head to the Etihad Stadium on Sunday to take on reigning Premier League champions Manchester City. The Blues’ form has been inconsistent of late, with a 5-0 win over Huddersfield Town at Stamford Bridge last time out following a 4-0 defeat away to Bournemouth. City, meanwhile, have won ten of their last eleven outings in all competitions, a defeat to Newcastle United being their only blip in that time. The home side will be favourites to win on Sunday, and three points would see them maintain the pressure on Liverpool in the title race. 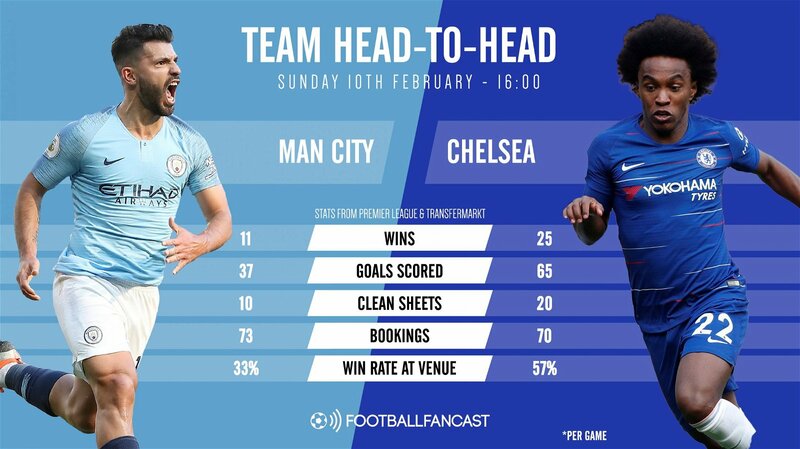 However, when Chelsea faced off against Pep Guardiola’s side earlier in the season, on home turf, they came out on top – so they know they have what it takes to win. Historically, over the course of the Premier League era, Chelsea have had the better of this fixture. However, since the Manchester club became a real force, competing for the top titles, they’ve gained supremacy over the Blues. Looking at the head-to-head record ought to give the west London club heart though. They greatly surpass their opponents in terms of goals scored and clean sheets previously in this fixture. Their 57% win rate at City’s ground is also a figure that should boost their confidence heading into this weekend’s encounter. How much of a difference it will make on Sunday remains to be seen, but history is certainly on Chelsea’s side at this stage. Hazard is Chelsea’s talisman, their primary creator, main goalscorer and best player. At his very best he can drag the Blues to victory almost single-handedly. Without him, Chelsea can become a shadow of themselves. If he turns up raring to go on Sunday then City have a reason to be worried. The Belgian is enjoying a fine campaign so far, having already racked up twelve goals and ten assists. His average of 2.7 shots, 3.3 completed dribbles, and 2.7 key passes per Premier League match makes it plain just what an effective and prolific attacking outlet he is for his side. 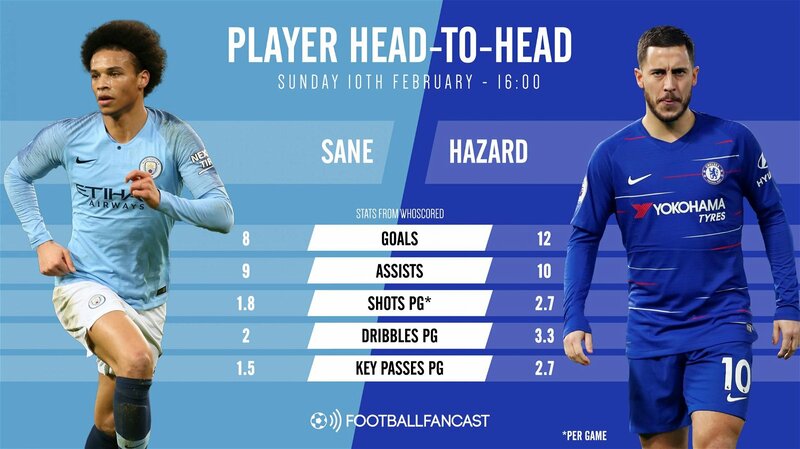 Sane’s figures are impressive too, if not quite at Hazard’s level. His return of eight league goals and nine assists – having played 1,446 minutes of Premier League football so far this season, compared to Hazard’s tally of 1,930 – is quite remarkable. City may be less reliant upon Sane than Chelsea are on Hazard, but that shouldn’t fool anyone into thinking the German couldn’t dominate Sunday’s game. In fact, what makes City such a terrifying prospect to face is the fact that Sane isn’t even a guaranteed starter. As well as the 23-year-old, Guardiola also has the likes of Raheem Sterling, Riyad Mahrez and Bernardo Silva to call on to play on the flanks. Even without Sane, City pose a huge threat. Conversely, without Hazard – or should the 28-year-old fail to produce his best form – Sarri’s side will be left toothless in attack. Ever the man for the big occasion, Mike Dean has been appointed to oversee the clash between these two Premier League heavyweights. The 50-year-old is one of English football’s most experienced and respected officials and will be determined to see that Sunday’s game plays out in an orderly fashion. Dean certainly won’t hesitate to assert his authority on proceedings by handing out the cards. Of the 18 referees to have taken charge of a Premier League fixture this season (prior to this weekend), Dean has shown by far more yellow and red cards than any of the others. He also averages more cards shown per match than any of his colleagues. A slightly fractured, combative game would likely suit Chelsea, though they’ll have to be careful not to overstep the mark on Dean’s watch. 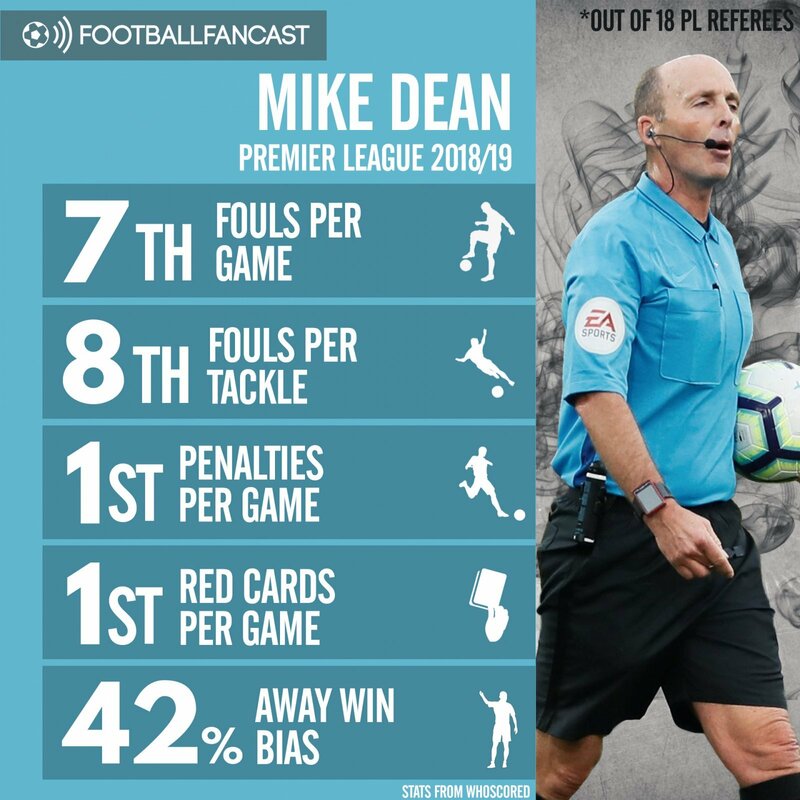 Another positive for the Blues is the fact that so far this season Dean has recorded a 42% away team win bias, the fifth highest out of all 18 referees. Manchester City come into this one with a relatively clean bill of health. Of the trio set to miss out – Benjamin Mendy, Vincent Kompany and Claudio Bravo – only left-back Mendy would likely have started were he at full fitness. As with basically every other position, Guardiola has plenty of alternative options to call upon to fill the left-back berth. Fabian Delph and Oleksandr Zinchenko have both featured in the role frequently this season. However, centre-back Aymeric Laporte impressed in the full-back role in City’s last two games, so should retain his place in that position. Guardiola has an embarrassment of attacking riches to call upon. Sergio Aguero will likely lead the line. He is a man for the big occasions, as his recent hat-trick against Arsenal proved. With the likes of Sane, Sterling, the Silvas, Mahrez, Gabriel Jesus and Kevin de Bruyne to call on though, whatever configuration of attackers City set up with, they can be relied upon to trouble Chelsea. With us tipping Sterling – who Transfermarkt value at £108million – to come back into the side though, Guardiola will be making just one change from the side that beat Everton in midweek. Like City, the visitors also come into this largely untroubled by injuries. January arrival Gonzalo Higuain will almost certainly lead the line and will be keen to add to his Chelsea tally, having opened his account with a well-taken brace against the Terriers last time out. In that game, Sarri shook up his starting XI by bringing in Andreas Christensen, Ross Barkley and Willian. However, we’re expecting only one of those players to survive and make it into Sunday’s starting lineup. While their performances can’t be faulted, an away trip to the Etihad Stadium is simply better suited to Mateo Kovacic’s sturdiness in the engine room, and Pedro – a favourite of both managers – certainly isn’t a bad option for what looks to be a highly-technical game. Overall, they’re the only two changes we’re anticipating from last weekend.